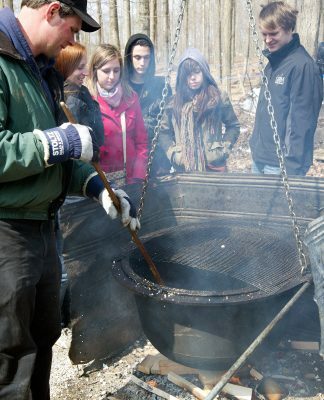 April 6 – 7, 2019 is Maple Weekend in Ontario, hosted by the Ontario Maple Syrup Producers’ Association. This is your chance to see how maple products are produced, from tree to table, along with the chance to taste and purchase quality maple products from local participating farms. Don’t forget – the Elmira Maple Syrup Festival also happens during Maple Weekend. It’s a day full of fun, activities and food; and yes – they offer Sugar Bush Tours too! DYK: There’s actually a maple syrup museum in Woolwich Township? At the Maple Syrup Museum located downstairs at The Mill in St. Jacobs, you’ll see artifacts used by Indigenous people to collect and boil sap. You’ll also learn about the production methods used by the pioneer settlers Waterloo Region, as well as more modern methods of production. The museum is open daily – check the website for hours. The sap only runs for a short time, so gather the family together, and make plans for some sweet springtime fun during the annual Maple Weekend!